This is what I bought with my November budget! Two printed blouses that are easy to throw on with jeans, but also perfect for TV segments (the sleeves are key). One extravagant holiday dress that I simply couldn't pass up thanks to a 50% off coupon. One blue striped shirt that was a replacement for a similar shirt I've loved for many years. One quilted puffer vest that is unlike anything I have in my closet and a trend I wanted to try. One pair of coated black jeans because I need new black jeans and fell in love with the zippers. (I'm unsure how classic the fabric is though, fingers crossed they withstand the test of time.) And finally, the shoes. I checked black ankle boots off my wish list. With a coupon code they came to $75, and then I used a $65 gift card from last Christmas. (Apparently I'm a gift card procrastinator.) The t-strap shoes are just too amazing to pass up at that price, plus I'm hoping to replace my worn out black and gold cap toe pumps. My December wish list is still in the works, but I am stalking the red/camel/black dress below. So I did a Babble post with 18 colorblocking options under $100. 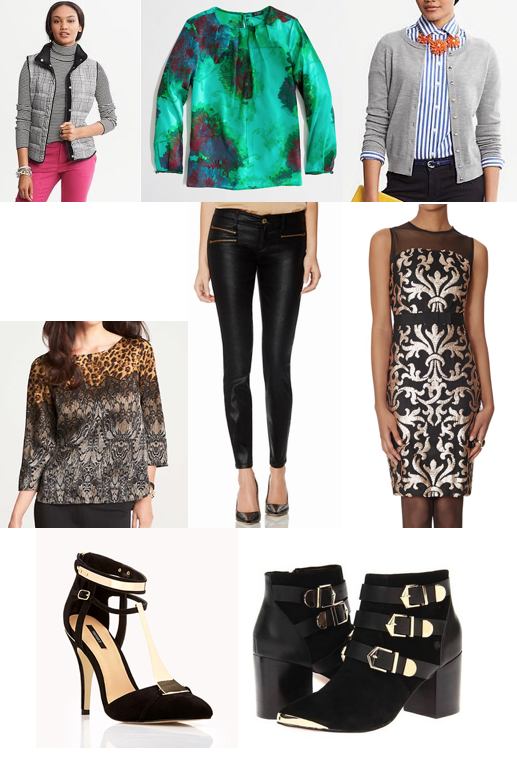 What clothing items and trends are currently on your wish list? New Babble post: "The Colorblock Trend: 18 Ways To Wear It This Winter"
Click the image to read! Everything is under $100.